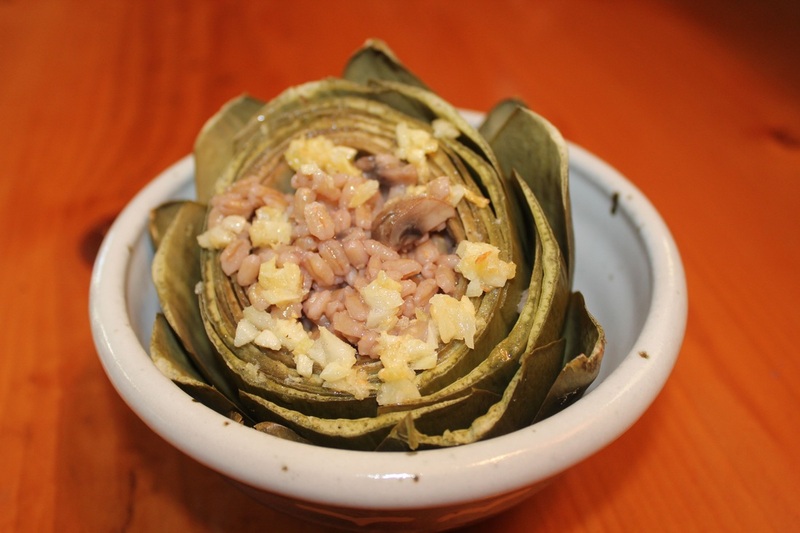 Garlic, mushrooms and barley make up the stuffing for these wonderfully hearty artichokes. Using a sharp knife carefully cut the stem and the top third off the artichoke. With scissors, cut the thorns off the lower leaves. Wash artichokes by separating the leaves under running water. Place a steaming basket in the bottom of a large saucepan with a tight fitting cover. Pour just enough water in the bottom of the saucepan to touch the steaming basket. Bring water to boil over medium high heat. Arrange artichokes top side up, in the steaming basket, cover and steam for 20 minutes. Turn off the heat and let sit 10-15 minutes with cover on. While artichokes are steaming, heat oil in a medium saucepan over medium-high heat. Add onions and garlic sauteing 3 minutes. Stir in mushrooms cooking until tender. Add water, broth, sherry and barley to the mushroom mixture. Bring to a boil, reduce heat, cover and simmer 20 minutes or until barley is tender. Stir in fresh thyme. Scoop the middle part of the artichoke out. (It's called the choke.) Stuff the center of the artichoke with some barley mixture. Serve warm.